The Game will be this Saturday and it will be a historic one for more than one reason (photo credit: Henry Trotter). This Saturday’s college football docket features one of the oldest rivalries in the game with a head-to-head matchup of Harvard University and Yale University. 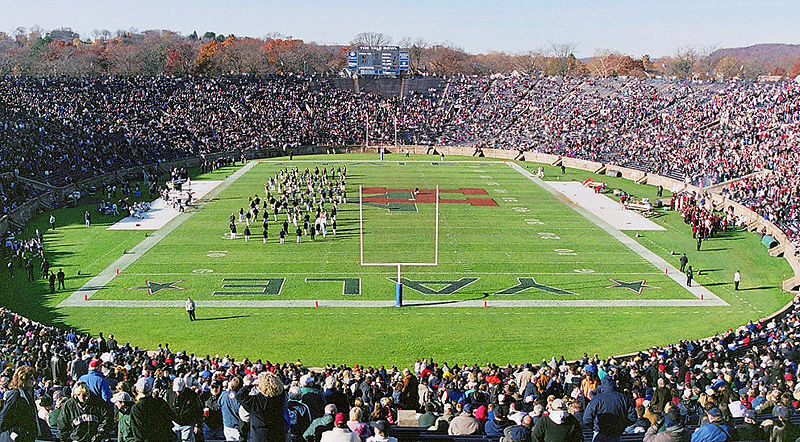 Harvard opened the Yale Bowl in 1914, one hundred years ago (although there were games between the two rivals before this year). But this Saturday’s matchup isn’t only significant because it’s the 100-year anniversary. It’s also significant because this Saturday’s matchup will be the first time in this historic game’s history that two African American captains will shake hands at the 50-yard line for the coin toss. Harvard, captained by Norm Hayes, and Yale, captained by Deon Randall, didn’t exactly have African American captains back around the time of the First World War. But, for the first, time both schools do now. And that is pretty cool! Ivy Coach salutes Harvard University and Yale University and their respective captains, Norm Hayes and Deon Randall, on this historic moment for two of America’s prestigious Ivy League universities and most storied football foes.